Peter Fisher is Director of Research and Consultant Physician at the Royal London Hospital for Integrated Medicine (RLHIM), part of the University College London Hospitals NHS Foundation Trust and Europe’s largest public sector centre for integrated medicine. He is also Physician to Her Majesty Queen Elizabeth II. He is Editor-in-Chief of the Faculty’s journal Homeopathy, a member of the World Health Organisation’s Expert Advisory Panel on Traditional and Complementary Medicine, involved in drafting its Traditional and Complementary Medicine Strategy 2014-2023, adopted by the World Health Assembly in May 2014, and a member of the Expert Reference panel of NICE. 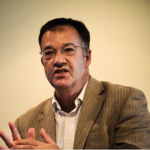 Peter Fisher is an active clinician, specialising in homeopathy and rheumatology. His research work centres on responding to the problems of health care, including ‘effectiveness gaps’, multimorbidity and polypharmacy, by integrating the best of conventional and complementary medicine. He has conducted numerous research projects in homeopathy and integrated medicine. His interest in the area was triggered by a visit to China during the Cultural Revolution while still a medical student at Cambridge University.